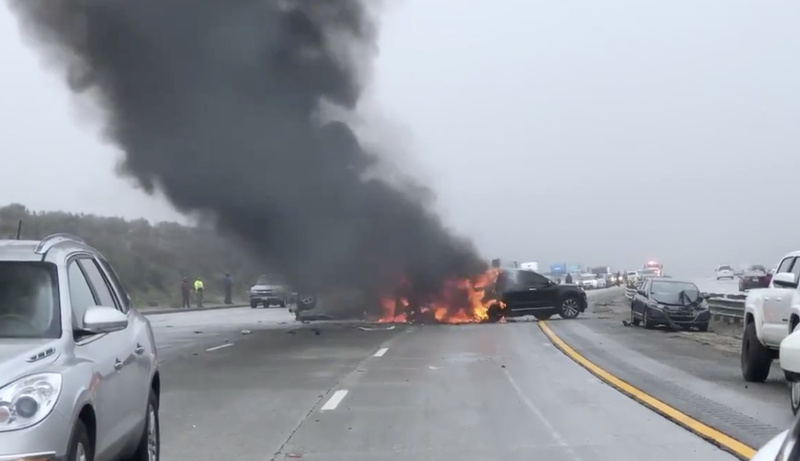 Updated Monday, March 24, 9:30 a.m.
A massive crash on the I-5 south near Gorman shut down the Grapevine in both directions for more than four hours on Saturday as heavy fog triggered a series of collisions and car fires. At least 30 vehicles were involved in crashes that stranded hundreds more vehicles and travelers making their way through the critical artery in and out the Los Angeles area. 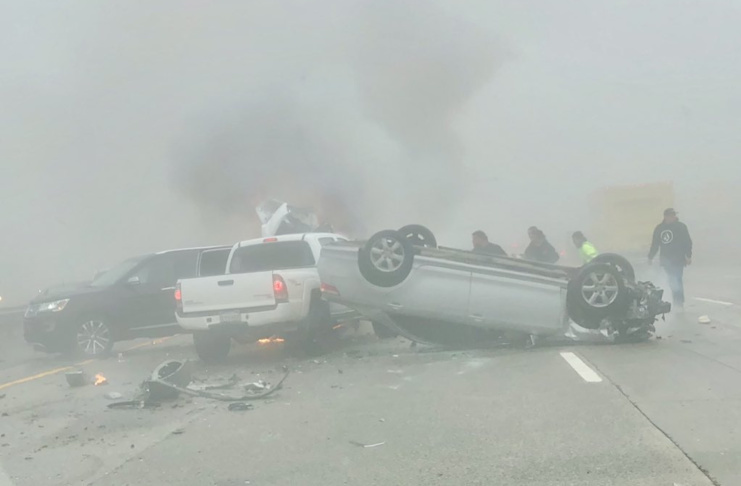 California Highway Patrol officials say dense fog led to the multi-car pile-up that left 15 people hospitalized, including a two year-old who was airlifted out in critical condition. A horse was also killed. Note: The toddler critically injured in the crash died at a hospital on March 27, according to L.A. County coroner's officials who released his name on April 1. Aden Poulson died from blunt force injuries, according to the coroner's report. He would have turned two on July 4. "We had less than 400 feet visibility that came in quickly," said CHP Sgt. Jeff Mesa, "and unfortunately we didn't have people who adjusted their speed accordingly." Shortly before 5:30 p.m. on Saturday Caltrans officials tweeted that the far right southbound lane had reopened. But it was hours more until others lanes were reopened for traffic. Authorities warned travelers to expect long delays and seek alternative routes, if possible. Jen Hughes was coming home to Burbank from Northern California when they had to slam on the brakes and veer into the freeway shoulder to avoid stopped cars. "You're at the mercy of who is coming up behind you," she said. "Our next worry? We could see cars fully engulfed in flames and you're thinking: 'What is the stage of this fire? Is it going to explode?'" Hughes said by the time their car came to a stop, she could see other drivers already out of their cars with fire extinguishers ready to help. Hughes said she and her daughter, who were driving home from spring break, made it past the initial crash site relatively quickly. Then they ran into a second pile-up, this one involving a horse trailer. Hughes said they encountered "heavy, heavy fog, then clear areas, then drizzle" on the road. "They're saying visibility might have something to do with it," she said. "It had everything to do with it." Los Angeles County Fire sent four paramedic squads, two air squads, two hazardous material teams and two urban search and rescue teams to help with response, according to scanner reports. Emergency responders from Kern and Ventura counties also assisted. CHP logs indicate, like Hughes reported, that an initial crash triggered a series of collisions. Travelers through the area captured some of the aftermath on videos with cars on fire and lanes clogged, showing heavy fog in the area. Hughes was among travelers on the road that tweeted videos of the aftermath. It's being called a mass casualty accident. 🙏 For everyone. Caltrans officials advised anyone needing to travel through the area to check back frequently on current road conditions. L.A. County Supervising Fire Dispatcher Ed Pickett said on Saturday that four other people were treated for moderate injuries, another seven people were treated for minor injuries and 22 people refused treatment at the scene. The crash scene, he said, was reported to extend over about one mile. Pickett also said several cars were on fire as a result of impact. He said low visibility appeared to be a factor in the crash, adding that fog-related collisions are common near Bakersfield but more rare at the location of Saturday's accidents. 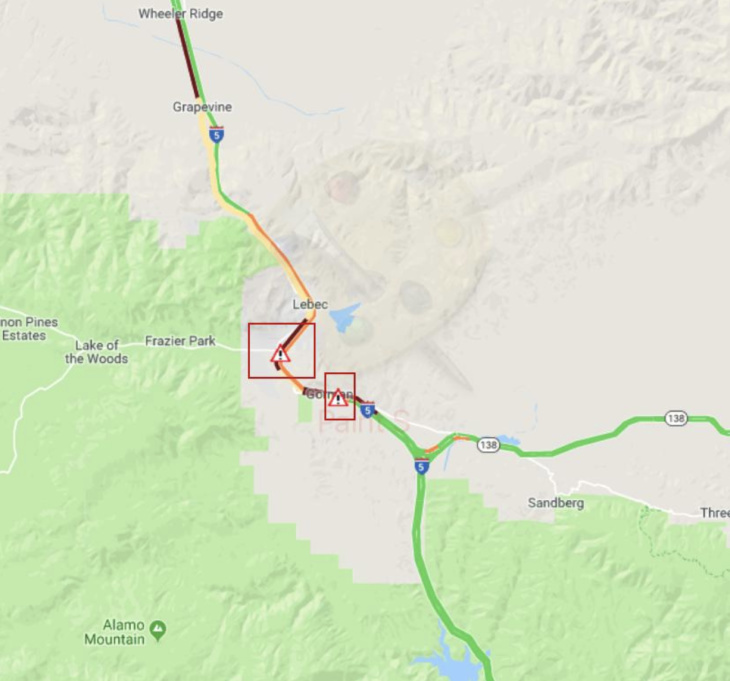 A map tweeted by Caltrans District 7 shows the location of a multi-vehicle crash Saturday. According to details on the California Highway Patrol website, the first report of a problem came about 2:45 p.m. Saturday. CHP officials reported as many as 100 cars were trapped in the area. By 6:30, those CHP logs indicated some drivers ran out of gas and had to walk off the freeway to get more. Hughes, who shared scenes of the crash on social media via her Twitter handle @JenPhoLi, said they were delayed at least an hour but felt fortunate. "It's one of those moment where you realize, if we hadn't stopped for gas we could have been in the middle of it," she said. Monday, April 1, 1:30 p.m: This article updated with the death of the toddler injured in the crash, as well as his name. Sunday, March 24, 9:30 a.m.: This article was updated with overall details of the accident. This is developing story updated several times on Saturday. It originally published at Saturday at 3:45 p.m.